Most teens are into music these days especially mp3, ipod and even mobile phones are very affordable already. I've been seeing my teenage nephew with his headset on while listening to music and using the computer. Youtube is also great place where we can listen to music and videos and that is for free. 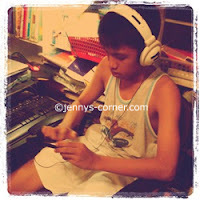 When he is not in front of his computer, I often see him listening music using his mobile phone. He just bought a new Samsung phone just last Sunday with his savings and he's been testing it non-stop and used it immediately. He enjoys music, computersgames and we're happy that he's not into bad vices. I'm not quite sure what genre of music he is listening to but I'm sure it's not rock or heavy metal because it's not in his personality. I remember the days when we're growing up, my bro and his dad are playing guitars and drums similar to great Pearl Drums for they love rock music way back in the 70's. Ahhhh.. what a nice cool/cold weather we are having lately. Enjoying the nice weather even though I got a bad cold since last week. 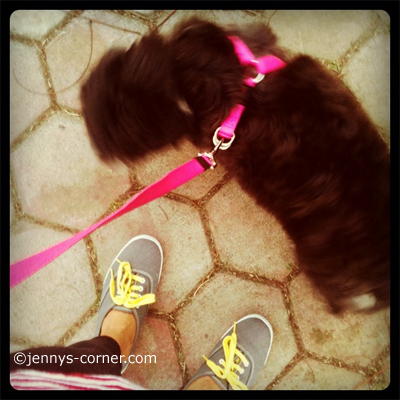 Since the weather is like that, I have decided to start my walking/jogging with my dog Sophie. Just last Friday, we went out at 6:30 am and go to the nearest village where joggers and bikers are going. The weather was gloomy and sometimes windy and eventhough Sophie and I walked for an hour or so, we didn't even sweat. We've been walking twice already and planning to walk again maybe Mon-Wed and Friday so I have continues exercise. After walking, I can feel that my body is energized and have feel alert. I'm not aiming to loose weight because I'm already skinny but walking can make my blood flowing, can improve my posture and can divert my mind to something else. I'm also planning of buying a rubber shoes that is apt for walking or jogging so that it'll be easier for me. I'm eyeing Skechers rubber shoes and I'm gonna buy soon. As you can see, I'm wearing a tennis shoes here and on our second day of walking I got bruises even though I have socks on. I know that proper shoes should be used to ensure there's no injury when doing certain kind of activity. Those that have problems with their feet might even need to wear lynco orthotics to relieve their sore feet. My legs are also hurting and it's due to non-stop walking for hours. I guess I might need to put a balm to relieve the pain, but it's not too bad anyway. I will try to walk again tomorrow if I can wake up early again. I just hope this walking/jogging will get into my system so that it can also improve my health and well-being. Birthdays will always be special no matter what age you are. If you’re turning 1 or 100 years old everyone needs to celebrate our natal day with or without a party. It’s like giving thanks to the Lord for giving us another day of existence in this beautiful world. Every month (except August), every family member of mine celebrates his or her birthday. Usually we have a cake and spaghetti if there’s no big party and it’s enough for anyone to enjoy. Last January 6, my nephew celebrated his 15th birthday and we had a small party exclusive for our family, classmates (only boys) and church buddies (he is one of the knights of the altar). It was fun for we also had a videoke where anyone who is brave enough to sing can show off their singing skills. The party ended with songs and laughter. A week after that, my dog Sophie celebrated her 4th birthday. I ordered a cake for her and cooked a special lunch too. I’m not sure if she knew that it’s her birthday but upon seeing her wagging tail, I bet she enjoyed the special treatment we gave her that day. February up until December will be birthday months for us and we’re always looking forward for each month to celebrate. There will be more candles to light and to blow and one thing is for sure, birthday is a happy occasion. When someone celebrates birthday, we usually don’t expect gifts from anyone but it sure is heart-warming to receive birthday gifts from anyone who remembered our special day. Looking for giving gifts to give can be a bit hard at times but once you know the likes or even hobby of that person then it’ll be easier for you. Browsing online stores like Spencer Gifts that offers unique and some naughty gifts can also help in finding the perfect gift. You can even get party supplies at that store. 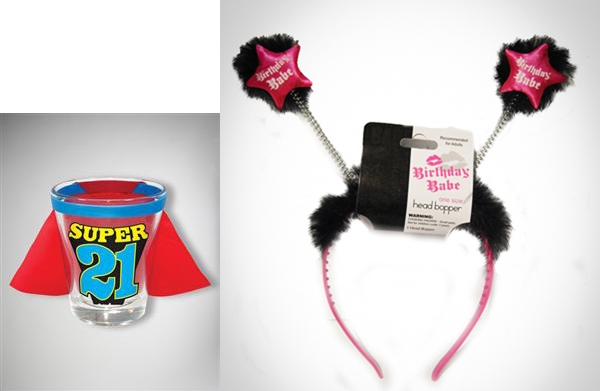 Inject some humor to any party and for sure you’ll have a one fabulous and cool party! 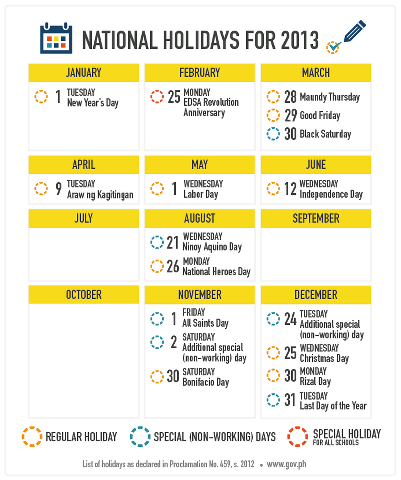 So here's the list of our National Holiday for 2013and if you're planning a trip overseas or just an out of town trip, you can use this guide. So with the looks of it we have long weekends on March and November 2013. I’m so very thankful that 2012 proved to be a good year for me, work wise. I have been blessed working online since 2007 and it is something that I am always grateful for I was able to manage our finances quite well. I reckon it’s a blessing given to me from above to become a financial support since my net café here in our neighborhood is not really picking up for years now. With the status of the business, I’m already planning of giving it up but I’m still holding on to it hoping that the situation will turn to be good in time. Other than that, my digital designs at an online store are still rolling and the sales on the last quarter of 2012 are quite good since a lot of people are ordering gifts for their loved ones. Slow months will come again soon so the sales will just crawl once more but I don’t mind that as long I have continues earnings on many different sources. Now that 2013 arrived, I still have high hopes that it will be a good year once again for me as long as I will be hardworking, patient and dedicated on my work. Nothing is impossible as they say especially when you exert a lot of effort or do all you can to earn in a clean way. I may be lucky but there are many individuals who are having some financial problems. Dealing with that kind of situation is never easy most especially when you have tons of bills filing up that need to be paid. There are options that we can do to recover but the pit of debt can be debilitating for many of us. In the US and other countries, people can file for personal bankruptcy and you need a good certified lawyer to be on your side that will explain you all about bankruptcy laws and all. A phoenix bankruptcy attorney can be of help to your financial woes. Their expertise can help you in the most crucial decisions about your finances and can guide and tell you more about the 3 main types of bankruptcy. Take time talking to your lawyer and discus what’s needed to be done to help you. Am praying that I will not experience bankruptcy woes or if it will come, I sure hope and pray that I can handle and can get through it. Hoping for a good year to all of us! Just when I thought I am done listing all the stuff that I wanted to buy at the 1st quarter of this year, it seems that my to-buy- shopping list is going to be long even before I hit the stores. I was browsing online last night and chatting with a friend via messenger, I found some tablecloth clips from premiertablelinens.com that I need for our table when I set them up outdoors. I know it's going to keep the table cloths in place when it's a bit windy during summer. I just hope that I'll find some at our local stores. I keep on reminding myself that I only need to buy stuff that I need and not want so I guess my list is reasonable enough for me to shell some money soon. It's not really for my personal use all of them are tools and utensils that I need to have in our kitchen soon. Now, I think I might need to stop browsing online for a while so that my list will not get longer soon. hehe..
Mikey Bustos is a Fil-Canadian Youtube sensation is here once again with his new Youtube video Opo Pinoy Style (Filipino Oppa Gangnam Style Parody) wherein he shows and tells more about some traits of the Pinoys trough the hit song of Psy. There's a surprise in the video because "AMALAYER" Paula is in it. I know, it's too early to be thinking about shopping and expenses at the 1st month of the year but I'm really itching to buy these stuff soon. I was suppose to buy some of the items on the list last Christmas but since the expenses are left and right so I just thought that I will just buy them this year instead. January is also tight for I have tons of bills to pay like SSS, BIR taxes, taxes for my small business, and whole lot more. However, I already have money allotted for those bills so I'm good this month. Thank God! He is really a good provider. I am thinking of shopping probably before the month ends so I can use my CC once again and it's already after the cut off date.. hehe. Anyway here is my To-Buy-List for 2013. 1. Turbo broiler - so that I can broil chicken and other food in it at home. 2. Blender - my mom has been asking me for the longest time to buy this but I'm always putting it aside. Since summer is coming in few months, it's also practical to buy one for we love making fruit shakes to cool us off. As you can notice, my list includes kitchen stuff and not for my personal use only.I'm also wishing to buy a tilt wall mount for our TV but I'll think about it first.